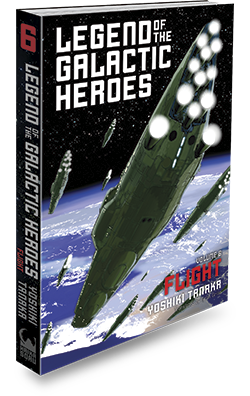 ﻿ Legend of the Galactic Heroes, Volume 6: Flight « Haikasoru: Space Opera. Dark Fantasy. Hard Science. After donning the emperor’s crown, Reinhard becomes the target of an assassination plot. Knowing that the Church of Terra is behind it, he deploys his troops to the church’s holy land: Earth. Meanwhile, Yang’s leisurely retirement is tempered by the surveillance networks watching his every move from both sides. And when he is one day visited by a group of men dressed in black, the galaxy, too, relinquishes peace to become embroiled in upheaval once again. Welcome to the turning point in the war for the fate of the galaxy! Elfriede stirred on the sofa. The evergreen oak door opened, and the master of the von Reuentahl residence cast his tall shadow across the floor. With his mismatched eyes, the man who’d taken Elfriede’s virginity admired her cream-colored hair and fresh limbs. One couldn’t wound the pride of a veteran hero with such cynicism and get away with it. The young admiral with the heterochromatic eyes let out a short, derisive laugh. He closed the door behind him and made his slow approach. His ferocity and grace were in perfect harmony. Ignoring his intention, the woman’s eyes were drawn to him. When she came to her senses, her right wrist was firmly in his grasp. Caught in von Reuentahl’s attractive gaze of gold and silver, Elfriede held her breath for a moment. Von Reuentahl released Elfriede’s white hand and brushed back the dark-brown hair hanging over his forehead. The sensation of his hand remained as a hot ring on the woman’s wrist. Von Reuentahl leaned his tall frame against a wall tapestry, deep in thought. Von Reuentahl stood upright from the wall, his expression deflated. The heterochromatic admiral banged the wall with his fist, enunciating every word. Elfriede remained on the sofa, a seated tempest. Elfriede ran out of breath and sank into silence. Von Reuentahl changed his expression. With renewed interest, he gazed at this woman who’d tried to kill him. A few seconds of silence passed before he spoke. As he turned his back on the woman struggling to find her retort, von Reuentahl left the salon in stride. Elfriede watched as his broad-shouldered silhouette receded, but she suddenly turned away, having caught herself waiting for this abominable man to look back over his shoulder. Her gaze was fixed on an unremarkable oil painting and stayed that way for ten seconds. When she finally looked back, the master of the house was gone. Elfriede had no idea whether von Reuentahl had indeed looked back at her.